What can we say about Canada that hasn’t already been said? It’s huge, it’s stunning, it plays host to some of the greatest adventures in the world. Just go - is our best advice! How does a small family-run and independent travel business like ours cover a country as large as Canada? The simple answer is that we can’t. Here at Artisan travel, we are taking Canada one province at a time because we are simply not prepared to skimp in order to flood our website with sub-standard holidays. Thus far, we’ve managed to cover The Yukon. This territory represents only a small part of Canada’s vast landscape but, we know that we have explored it to its fullest and therefore, done it justice. Based on our extensive research we have created, what we believe, are the perfect Yukon winter trips. One following the world-famous dog sledding race, The Yukon Quest and the other offering a taste of Canadian wilderness, based in the renowned Northern Lights Resort and Spa. Winters in the Canadian North are full of excitement and adventure. The deep snow and cold temperatures mean that you can enjoy a range of winter activities, such as dog sledding, snowmobiling and ice fishing throughout the winter months. The landscape is blanketed in snow and, for the uninitiated, it can be a daunting place. That is why we ensure that our guests travel with expert wilderness guides on dog sled safaris, snowmobile trips and those all-important Aurora hunting missions, which are part of our Winter at the Lodge holiday. There are many rivers which are too easily described as being “Mighty” but, we make no apologies for applying it to The Yukon. Even the Mighty Yukon - See? No apology! - freezes in winter, but this means it then acts as a winter highway for other methods of transportation, such as dog sledding, which is certainly the case during our Yukon Quest holiday. The Yukon takes its name from the Yukon River, which runs through the territory. The name is derived from the native word ‘Yuk-un-ah’, meaning ‘Great River’. There is certainly truth in the name, as it spans a distance of 1,980 miles, from British Columbia all the way through Alaska and in to the Bering Sea. We always like to write a few short paragraphs about our own favourite experiences in the destinations we feature. The Yukon poses a slight problem as we have simply done and seen so much here. So, for the sake of brevity here are a few of our most memorable Canadian moments. There’s a magic to The Yukon. Towns like Whitehorse and Dawson City hail back to the last great gold rush which witnessed a horde of humanity sweep north in search of untold riches. The 1897 Gold Rush only lasted a couple of years but its legacy lives on to this day. What better way to recreate the pioneering spirit of the gold rush era than during an adventurous trip following the world-famous Yukon Quest dog sledding race along the former gold rush trails. Dog sledding through the forests and frozen rivers of the Yukon is a fantastic experience, especially while the Yukon Quest dog sledding race is underway from Whitehorse all the way to Fairbanks, Alaska. Sitting under the night’s sky at the secluded Northern Lights Resort & Spa, is an incredibly relaxing and rewarding experience. With minimal light pollution and unobstructed views north, it’s the perfect place to search the skies for the Northern Lights, silhouetted by the jagged mountain peaks on the horizon. This is why we make sure to include nights here during our Winter at the Lodge trip. Here at Artisan, we research a destination very, very thoroughly before satisfying ourselves that we should feature it as a holiday destination. Canada is a bit of a problem in this respect because it’s so very large and so are its provinces and territories. We’re slowly working our way through Canada’s northerly territories. Thus far, we’ve managed to cover The Yukon to our satisfaction and we’re sure that our trips to this remarkable territory will leave you as spellbound as we were during our visits there. 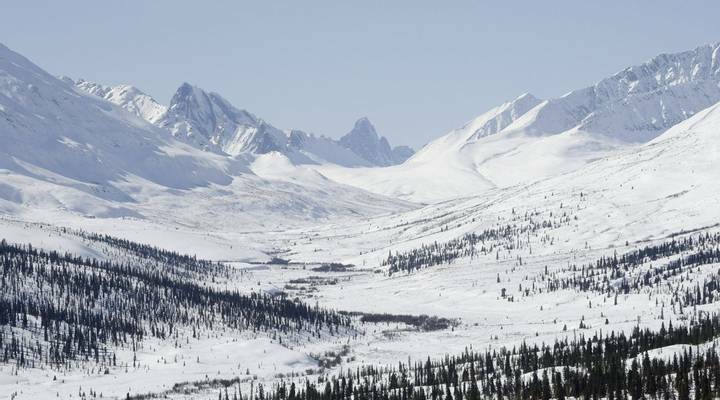 There can be few places in the world that remain as untouched as Canada’s Yukon Territory. Still most famous for the Gold Rush of the late 19th century, this vast tract of land with its iconic river is an outdoorsy heaven. The capital, Whitehorse, is the place to start. It doesn’t look like much as you fly in but dig deeper and there is much here to reward. Artisan bakeries, cafés selling superb “cups of Joe” and it all comes with that frontier town feel. Further north in Dawson City, it’s as if the gold rush never ended, with boardwalks lining the unpaved streets. Close your eyes and imagine the sound of a raucous rabble-rousing emanating from the saloons and the cries echoing across the mighty Yukon River……”There’s gold in the Klondike!”. Beyond Whitehorse, it’s all about exploring and adventure. Winter brings a whirlwind of excitement in the form of dog sledding, snowmobiling and of course, the ethereal Northern Lights. The world-famous Yukon Quest also runs every year, with teams of mushers and their dogs travelling over 1,000 miles from Whitehorse to Alaska.